“Sorry,” said Cranky Bunny, trying to put a smile on his face. Cranky Bunny and Aunt Sarah were having a lot of fun at the Easter egg hunt. Cranky Bunny was able to get quite a few Easter chocolates. “I am so happy to see you enjoying yourself,” said Aunt Sarah. Cranky Bunny heard a loud voice behind him. It was the voice of Sammy, a neighbour of his. “I do suppose you are right,” said Sammy. “Does that mean you do like Easter now?” asked Cranky Bunny. “Very true,” said Aunt Sarah. “I love you,” said Cranky Bunny. “I love you as well,” said Aunt Sarah, giving Cranky Bunny a hug. It is important to love your family. Example: Cranky Bunny helped his neighbor to understand why he should like Easter and also that he should love his family. 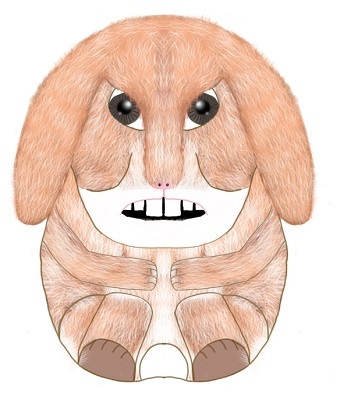 This entry was posted in Cranky Bunny Stories, Easter Stories, Easter Story Challenge 2018, Grade 3 Level and tagged Cranky Bunny, Easter, Easter egg, Easter eggs, Family, happy, love, suit. Bookmark the permalink.